This event is wheelchair accessible. Individuals requiring Sign-Language Interpreters, Real-time captioners, or other accommodations should contact Shirley Alfaro at (773) 245-1621 or salfaro@nphm.org at least one week in advance of the event. 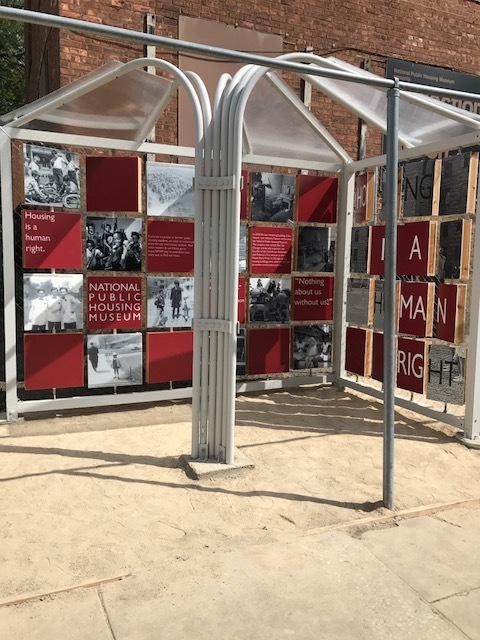 Throughout the summer, NPHM partnered with ACE Mentor Program Chicago, an organization dedicated to providing high school students career opportunities in architecture, construction and engineering, to create an on-site installation at the future home of the museum. The ACE Summer Design team, comprised of rising high school seniors and professional mentors, unveiled the design project that has been in the works for 8-weeks on Friday August 11th. The design reflects the opening of the museum and extends to the surrounding community a glimpse of what is to come. The installation will stay standing throughout the construction of the museum. As NPHM works to build a strong community within and for the museum, we understand that often young people are at the forefront of these efforts and issues. This project showcases just that. You can visit the installation at 1322 W. Taylor St.
Today, ArtPlace America announced that National Public Housing Museum is one of 70 finalists for the 2017 National Creative Placemaking Fund (NCPF). ArtPlace selected these 70 proposals from 987 applications, making National Public Housing Museum’s project one of just 7% of the projects across the country to make this cut. The Entrepreneurship Hub at the National Public Housing Museum will be located at the future home of the Museum at 1322 West Taylor Street, the last remaining structure of the 1938 historic Jane Addams Homes public housing development. The project is inspired by the resilience of Chicago’s public housing residents who have worked in informal economies as artists, hair stylists, food purveyors, fashion designers, and social entrepreneurs. The Entrepreneurship Hub focuses on Chicago’s homegrown talent and invests in the innovative potential of public housing residents by providing support, resources, and collective imagining as they move their businesses from the kitchen table to the storefront and beyond. The Museum will use its cultural capital as well as its existing relationship with Chicago Housing Authority to nurture and grow the social and economic capital of low and very low-income people by providing gathering space to share knowledge, giving opportunities to build business skills through workshops, and offering creative, cultural, design, and architectural services to public housing residents in a dedicated effort to help realize their fresh, dynamic ideas. The Hub will be, as one resident put it, “a hand up, not a handout.” Rather than individualism or self-reliance, the Entrepreneurship Hub at the NPHM emphasizes community, interdependence, and the common good in order to advance sustainability and strengthen the city’s economic, social, and cultural fabric. "The National Grants Program is actively building a portfolio that reflects the full breadth of our country’s arts and cultural sector, as well as the community planning and development field,” said ArtPlace’s Director of National Grantmaking F. Javier Torres. “Knowing that these projects, and the hundreds of others who applied, are using arts and culture strategies to make the communities across this country healthier and stronger is inspirational "
The complete list of the 2017 finalists for ArtPlace’s National Creative Placemaking Fund may be found here. In partnership with Oral History Summer School. Have you ever used a housing choice voucher? Come and tell us about it! 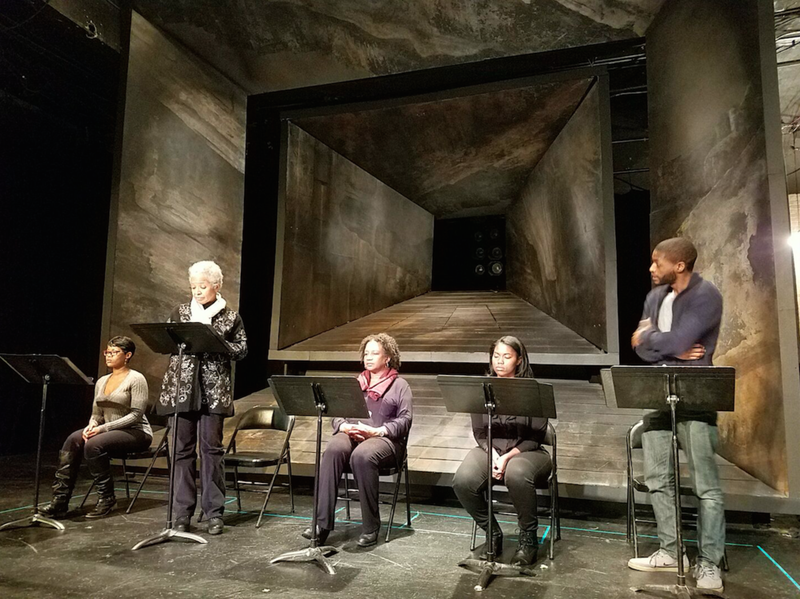 The National Public Housing Museum is excited to deepen our relationship with the American Theater Company to co-create a curriculum around the hit play The Project(s) which brought the voices of public housing residents to the stage to rave reviews in 2015. The curriculum and a condensed touring version of the play will be coming to Chicago Public Schools beginning this spring through American Mosaic, a program pairing teaching artists with ninth-grade English teachers to deliver an intensive six-week arts residency in Chicago Public Schools. In addition, the ATC’s Youth Ensemble will perform The Project(s) this summer. NPHM will contribute to the curriculum in order to give teachers the resources they need to lead conversations about the fundamental role that housing plays in building thriving communities. The Chicago Tribune and the Chicago Sun-Times recently covered the collaboration. Click here to see the original coverage of The Project(s) by the Chicago Tribune. At a press conference on Wednesday, we got a sneak peek at the touring version, timed to fit inside of a class period, and actor Joslyn Jones, who plays Miss Beatrice Harris in the production, got to meet her character’s namesake. Toward our mission to preserve, promote, and propel housing as a human right, will you help us invest in the next generation of civic leaders? Board vote puts museum on track to open doors in 2018 at 1322 W. Taylor Street in Chicago. The last extant Jane Addams Homes building at 1322 W. Taylor Street, the site of the future National Public Housing Museum. A Chicago Housing Authority board vote Tuesday signals a leap forward for the National Public Housing Museum. The board approved a lease agreement that will enable the Museum to lease half of the CHA-owned building on a long-term, $1-a-year lease. “This is such an important milestone for the Museum and we want to express our deep gratitude to the CHA board and staff for this vote,” said Transitional Executive Director Pat O’Connell. The NPHM board and staff are raising additional funds for the build-out, planning a first phase opening and preview exhibit for October 2017 as part of the Chicago Architecture Biennial, and conducting a search for an executive director. On Saturday, October 1st from 11 a.m. to 3 p.m., at 1322 W. Taylor St., the Museum has scheduled a celebratory “Last Look” event inside the red-brick building, designed by John Holabird in 1938. This event, which is free and open to the public will be the last public viewing of the Museum before construction begins. For more information, please visit www.nphm.org. and sign up on the event’s Eventbrite page. 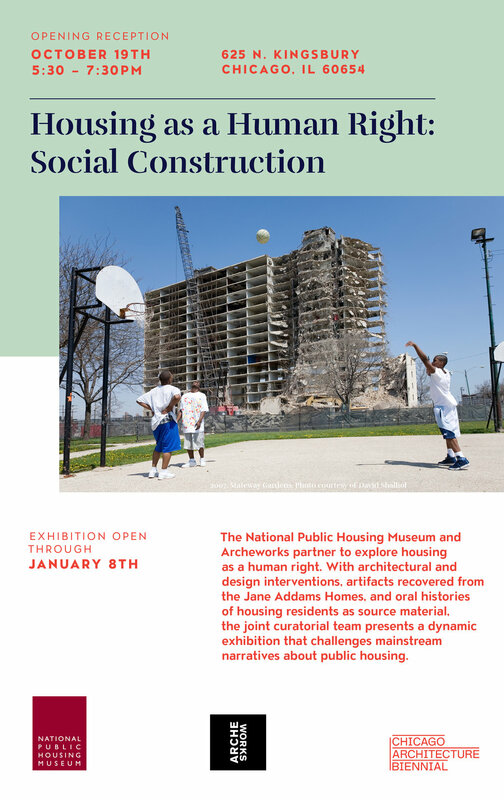 The National Public Housing Museum is the first cultural institution in the United States dedicated to interpreting the American experience in public housing. The Museum draws on the power of place and memory to illuminate the resilience of the poor and working class families of every race and ethnicity to realize the promise of America. It seeks to open its permanent home in the last extant building of the Jane Addams Homes. The Jane Addams was part of ABLA Homes (an acronym for three other housing developments including the Robert Brooks Homes, Loomis Courts, and Grace Abbott Homes totaling 3,596 units) and sits prominently within the Little Italy neighborhood. To RSVP for this program, CLICK HERE. 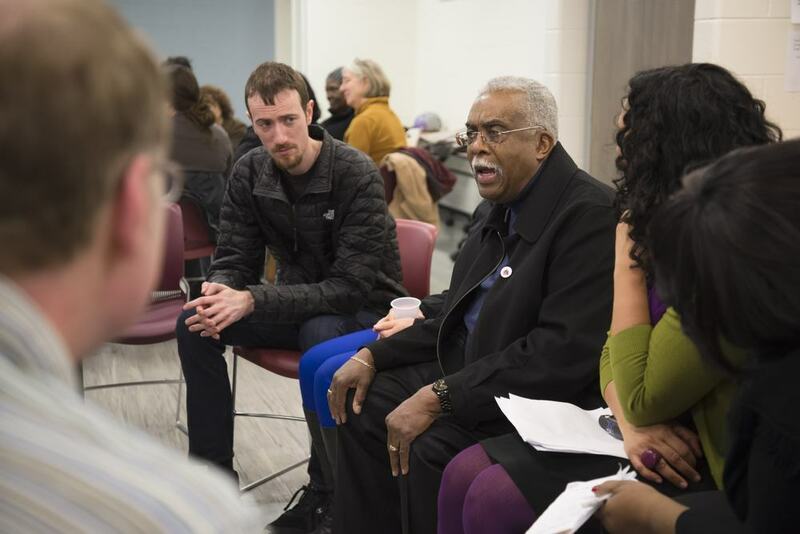 On Thursday, June 16, the National Public Housing Museum will host its third iteration of the Telling Stories, Telling Belongings program in Rockford, Illinois. The program, inspired by the initial grass roots efforts of public housing residents to found the Museum, will use the power of personal narrative and storytelling to connect with material culture. In partnership with the Rockford Housing Authority and the Rockford Area Arts Council, the Museum is excited to help change perceptions of public housing as well as offer an opportunity for Rockford residents of all backgrounds to connect and form new relationships. As a physical museum, the NPHM will work to collate public housing narratives from across the United States. Telling Stories, Telling Belongings, is one such way the institution uses collective memory through public programming to increase the impact of these stories nationally in telling the Museum's story here in Chicago. 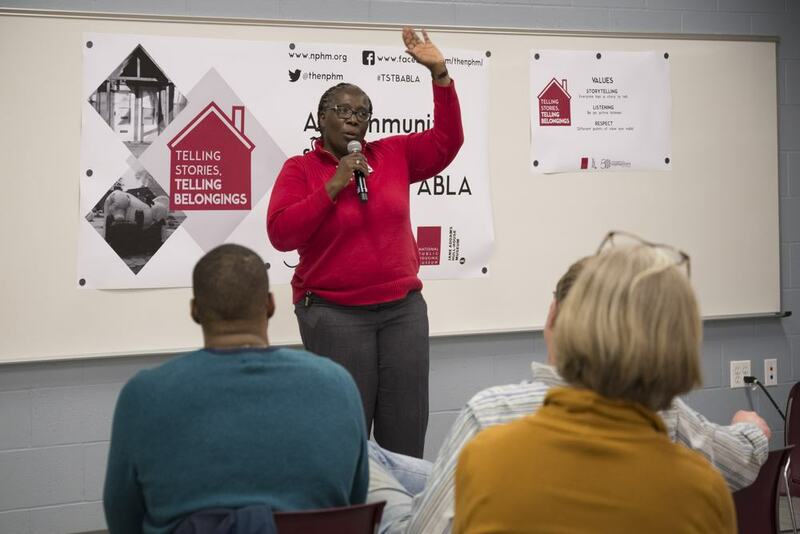 In a community "show-and-tell" format, Rockford community members including public housing residents will have the opportunity to tell a story personal to them. 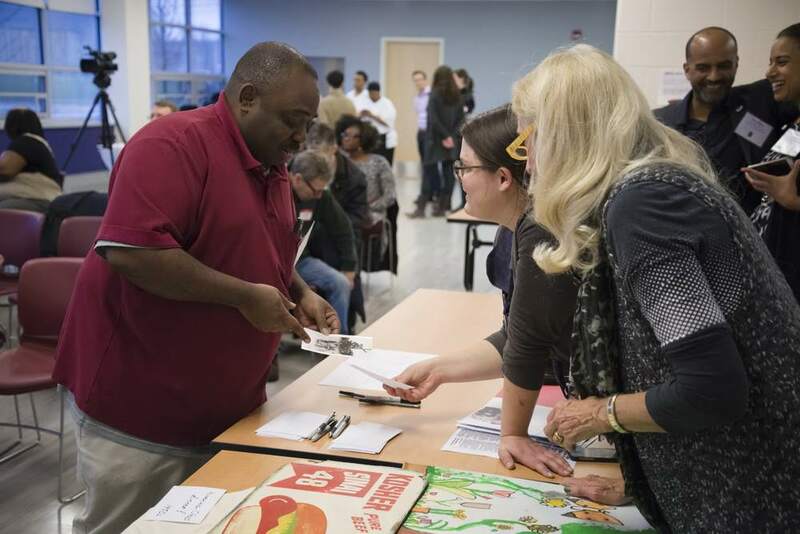 Be it a story of growing up in public housing, a first date, or a birthday, the evening program, like the program hosted in Chicago in March, will feature stories through cherished belongings that recall memories worth recounting and reliving. Inanimate objects hold intrinsic power to open up memories and also force stories to the surface. As the National Public Housing Museum moves closer to groundbreaking in 2017, we anticipate the objects or belongings brought to Telling Stories, Telling Belongings programs as a candidates for objects in our museum collection. Together the Museum looks forward to Rockford stories and the personal narratives that assign meaning to everyday objects. Through these everyday objects, we can begin to understand the everyday importance of community relationships which help not only to change perceptions of public housing and its residents, but also change perceptions of a community and its diverse background and experiences. For a program press release, CLICK HERE. From left to right, poet presenters Shakira Johnson, Sandra Cornwell, and Salyndrea Jones. Charlie Barlow is in the back. Last night, over 60 members of the public came to hear three poems by both former and current public housing residents about their experiences in Chicago public housing. Led by Charlie Barlow, a Lecturer in Public Policy and Geography and the current Director of the Chicago Policy Research Team at the University of Chicago, the policy conversation used three poems to help create discussion and interaction among the poet presenters and audience members. A former resident of Stateway Gardens, Salyndrea Jones delivered a poem of her public housing experience when her family was relocated to mixed-income housing. Shakira Johnson presented her poem on living in Westhaven Apartments, a mixed-income community that replaced Henry Horner Homes. Lathrop Homes resident Sandra Cornwell recalled in her poem the Chicago Housing Authority's Plan for Transformation opening up discussion among audience members and her fellow poet presenters what lies ahead for public housing and the future of affordable housing. Thank you to all that attended and we look forward to keeping you engaged in events in Chicago and Rockford, Illinois this summer! How did we do? If you attended the program last night and did not fill out an audience evaluation, please tell us what you thought in this brief survey! The Museum would like to acknowledge Ryun Miller and Robert Baudry for volunteering at this event. Would you like to volunteer at a future event? Please contact Daniel Ronan, the Manager of Public Engagement, at dronan@nphm.org, or (773) 257-7241. The Museum would also like to acknowledge Maggie Queeney of the Poetery Foundation for guiding Shakira and Salyndrea through the poetry workshop to create the poems you see below. Salyndrea lived in the Stateway Gardens public housing project from when she was born in 1993 and moved out in 2003. In that same year, Salyndrea and her family moved to Englewood into the St. Agnes Village Apartments until 2007 when her family was relocated to the new mixed-income development that replaced Stateway Gardens, the Park Boulevard Apartments. She recently moved out of her mother’s home in Park Boulevard into a low income apartment near 67th and Stony Island. At the end of April, Salyndrea participated in a workshop with the Poetry Foundation to develop this poem. Bricks and gravel on an empty lot. This project was never made for the saving grace. I got a taste of the black power mixtape now everything in my eyes looking a little vague. "icy cup, chips with cheese me please" to the lady on the 4th floor that was the candy store. Shakira lived in Westhaven Apartments (on the site of the former Henry Horner Homes) in the Near West Side from 2005 to 2015. From Westhaven, Shakira moved into the Noble Square Senior Apartments to live with her grandmother. She now lives in a building in Humboldt Square where she pays 30% of her income in rent to an affordable housing developer. At the end of April, Shakira participated in a workshop with the Poetry Foundation to develop this poem. Peeling paint, old brown bricks, construction on every floor. Sounds, laughter, cries of pain, secrets behind every door. Apart for years, family ties reuniting. Relationships torn apart by the rumors started behind the next door. Levels up there's windows, with missing screens and dust. Bars on the windows, feeling trapped in my own home. Secrets, lies, laughter, tears of pain, even tears of joy. Thin walls with many doors, something’s going on. Adults fighting while children are playing. There's the beating of the drums. This is where I belonged. Sandra has lived in Julia C. Lathrop Homes, located at Clyborn, Damen & Diversey, for 28 years. She has been the Lathrop Local Advisory Council president for eight months and before served as the LAC’s long-term secretary. In addition to her LAC activities, Sandra has also been a part of Lathrop’s tenant patrol and has held various volunteer positions in community groups such as Friends of the Chicago River and churches in her community. A self-taught poet, Sandra has taken to writing about her experiences in public housing. The Chicago Tribune features writer Steve Johnson showcased the work of the NPHM as the Chicago Housing Authority moves to finalize the lease for the Museum's future home on Taylor Street. Titled "Chicago National Public Housing Museum aims for conscience," the article features the history of the Museum in the making as well as our key supporters. As the CHA's CEO Gene Jones is quoted about the Museum, "It will also serve to highlight the role that public housing has played in the lives of Chicagoans while ... transforming (the building) into a vibrant community asset." — We couldn't agree more. Moreover, we plan to build an institution which will interpret the public housing experience here in Chicago and in communities across the United States. We need your help. As we begin construction of our building in 2017, we need your stories — whether you've been a resident, worker, policymaker, neighbor, or visitor — to interpret public housing and its residents on a national scale. To send us your story, please contact Daniel Ronan, the Manager of Public Engagement, at dronan@nphm.org or at (773) 245-1621. And, as ever, we appreciate your financial support. We would also like to invite you to our program this Thursday at Quinn Chapel which will feature the poetry of public housing residents and a discussion from resident perspectives on the implications of Chicago's Plan for Transformation. Please RSVP here. Thank you for your ongoing support as we move ever forward. 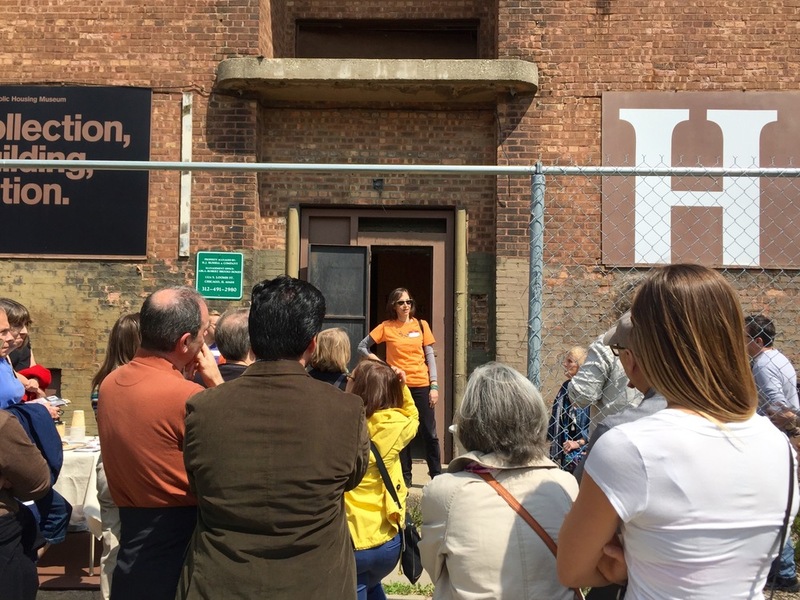 On Sunday, over 50 people came out to enjoy the Mother's Day sunshine at the future site of the National Public Housing Museum to learn about the legacies of Jane Jacobs and Jane Addams. With coffee and cookies from Scafuri Bakery across the street, tour and walk participants heard about the Little Italy neighborhood, its history of ongoing redevelopment and the debates which have shaped this neighborhood on the local and national scale. Starting at the Museum building at 1322 W. Taylor St., after a brief tour of the Museum's standing exhibit, Collection, Building, Action., two groups walked over to Hull-House for an in-depth tour into the life and legacy of Jane Addams. We look forward to participating in next year's Jane's Walk! Clarence shows event volunteers his photographs he brought to share. A belongings table features the objects guests have brought to share at ABLA. Ida shares here story through a painting of her 7-year-old child. ABLA Vice President Ms. Louise Hill addresses the crowd. Group breakout circles provided a more intimate setting for storytelling. Tammy shares her story in here group. The event featured public housing residents from various generations as well as their children. The group format helped individuals connect the different memories of community stories. A storyteller recalls her past. Peter shares a hot dog sign from the now demolished Maxwell Street Market. Richard talks about the Near West Side of Chicago. Tammy presents her birth certificate which shows her birth in the Cabrini Homes through a midwife. Tammy excites the room with her story. A storyteller speaks to her family in the neighborhood. A former author of the Resident's Journal, addresses the story of a previous storyteller. Crystal Palmer, the Vice Chair of the National Public Housing Museum board, shares her story. Event attendees connect over their cherished objects. Event attendees received commemorative pins for the event emblazoned with "I am a Storyteller." Moderated by Jennifer Scott, the Director of the Jane Addams Hull-House Museum, the night featured ABLA residents who recalled the stories and memories of public housing in the adjacent public housing projects – the Jane Addams Homes, Robert Brooks Homes, Loomis Courts, and Grace Abbott Homes. Joined by members of the community, the event offered an opportunity for public housing residents and their neighbors to exchange stories in groups as well as on the community stage. Featuring cherished belongings from those in attendance, individuals used objects to open their minds to stories and memories nearly forgotten and seldom heard. Four break out groups allowed for more intimate storytelling, allowing storytellers to connect with their fellow neighbors to recall different perspectives of the past. Local refreshments provided by Marilyn Scott of Cobblestone Bakery, a Section 3 vendor, and Kelly Lynch of Scafuri Bakery, provided the needed social lubrication and elbow rubbing to inspire new conversations from old memories. Recalling her life story, ABLA Local Advisory Council Vice President Louise Hill reminded the room, "If you don't have a story, you don't exist," opening up event goers to consider their seemingly ordinary stories and belongings as objects worthy of telling. Building off of our event-based oral history work the National Public Housing Museum started in December 2014, the Museum looks forward to collecting more stories to grow our future programming, collection, and exhibits. 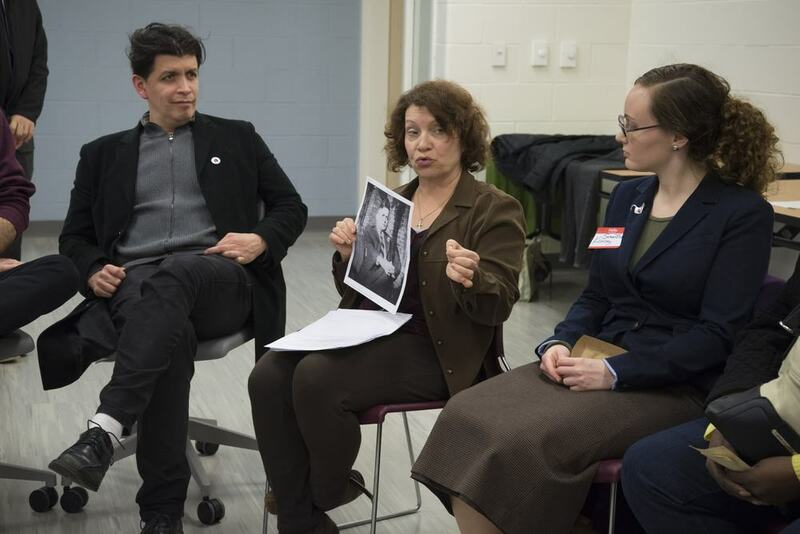 This program is funded in part by Making the West Side, a National Endowment for the Humanities grant led by the Jane Addams Hull-House Museum. 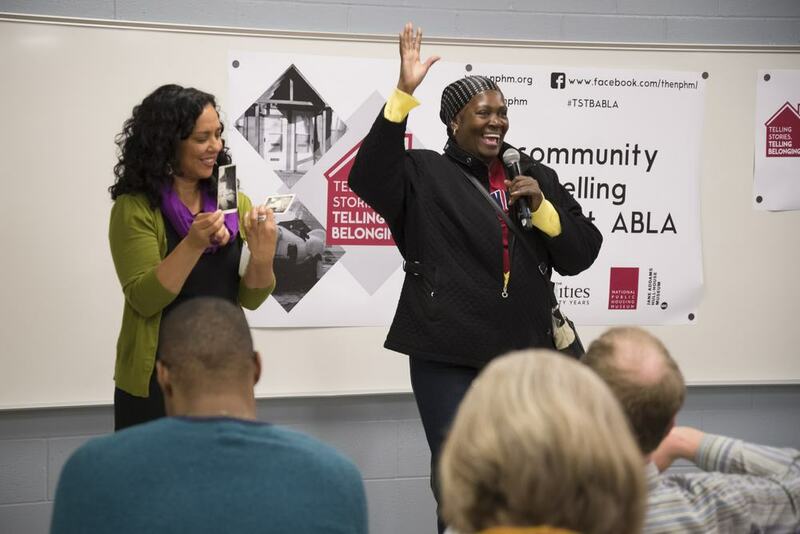 The National Public Housing Museum is excited to partner up with ABLA Local Advisory Council and ABLA and community residents for an evening of community storytelling. 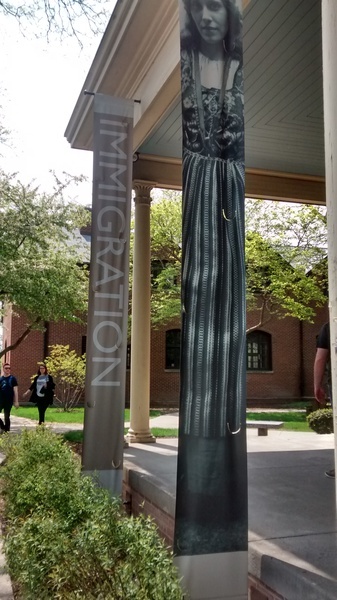 The Jane Addams Hull-House Museum will also join us in leading the program. Everyone is welcome, regardless of whether you have a story to tell. Come and share, or come and listen to the wealth of stories from ABLA and Roosevelt Square! We'd love it if you could RSVP by taking a moment to fill out THIS FORM. See you on Thursday, March 24th! For a press release, CLICK HERE. We would like to share some news. As you may know, our previous executive director Charles Leeks left the museum to pursue other opportunities. We're delighted that Charles remains supportive of the Museum and our efforts to share the stories and lessons of public housing. The board of directors is using this time of transition as an opportunity for creativity, reflection, and renewal. To that end, we have engaged the services of Pat O’Connell as our Transitional Executive Director. Pat has more than thirty years of experience in the Chicago nonprofit sector, working in areas such as community development, healthcare, social services, and the arts. She has served as Executive Director of Claretian Associates, a housing and community development organization on Chicago’s southeast side, and the ACE Mentor Program, an organization providing educational and career mentoring for disadvantaged and minority youth in the Chicago Public School system. For the past 15 years, Pat has managed her own consulting practice, working with a variety of nonprofit organizations on capacity building initiatives. With Pat’s leadership, NPHM will continue its exciting work with CHA to finalize the construction timetable for our permanent home. The inclusion of NPHM in the final masterplan by Solomon Cordwell Buenz and CHA demonstrates NPHM's future role as a neighborhood anchor. We will also continue to prepare the opening exhibits for the museum, and to build on our past programming including connecting resident experiences to conversations about policy and design and the future of housing as a Public Good. Pat will work to strengthen our systems to get us ready for our next steps. We are looking forward to sharing more news about all of these developments in the coming months. In the meantime, if you would like to contact Pat, you may reach her at poconnell@nphm.org. Thank you so much for your continued interest and support! "One of the biennial’s brighter ideas is to keep its attendees (some thirty-one thousand at the opening) the hell out of such archi-tourist traps as Frank Lloyd Wright’s Oak Park. Most of the programming outside the main venue, the Chicago Cultural Center on East Washington Street, is in such places as the National Public Housing Museum—lodged in the ruins of the former Jane Addams Homes, and exhibiting the engaging House Housing study from Columbia University’s Temple Hoyne Buell Center." "The exhibitions offer anything but a conventional museum experience — paint is peeling off the concrete walls and steel door frames are rusting. Yet as arranged by curator Todd Palmer, the shows collectively humanize the residents of public housing even as they reveal how public housing itself became so dehumanizing. " "Chicago has a very particular historic context in terms of housing. "Partnering with the NPHM, which grew out of that context, aided both institutions to expand the conversation about housing as a public good. " “We’re trying to draw attention to a problematic history to galvanize public interest in resolving these issues,” says NPHM curator Todd Palmer...The exhibition’s setting—the shuttered Addams building, abandoned since 2002—demonstrates the consequences of not resolving these issues. Visitors stroll past boarded up windows, peeling paint, and rusted doorframes, once the dwellings of residents. The rabbit-warren corridors where audio clips whisper Frank Lloyd Wright’s qualified approval of the Soviet Union and Frank Gehry’s ambitions for his Santa Monica House creates an aura of domesticity torn apart from within and without. "While you look at exhibits, you listen to stories that resonate with them. Voices blending in the air. A variety of perspectives." "Particularly notable [at the Biennial] are the opening of Theaster Gates’s Stony Island Arts Bank on the city’s South Side, and a staging of the Temple Hoyne Buell Center’s House Housing exhibition at the nascent National Public Housing Museum. Both are located in historic buildings that rival the Cultural Center in social significance." Visits from our Chicago, U.S., and International Neighbors! We're so happy to count among so many visits from our supporters! Above is a photo from the International Housing Partnership conference comprised of public housing practitioners from across the Commonwealth - United Kingdom, Canada, Australia, and New Zealand - as well as the U.S. The group came to Chicago for their annual conference and made a point to stop by! 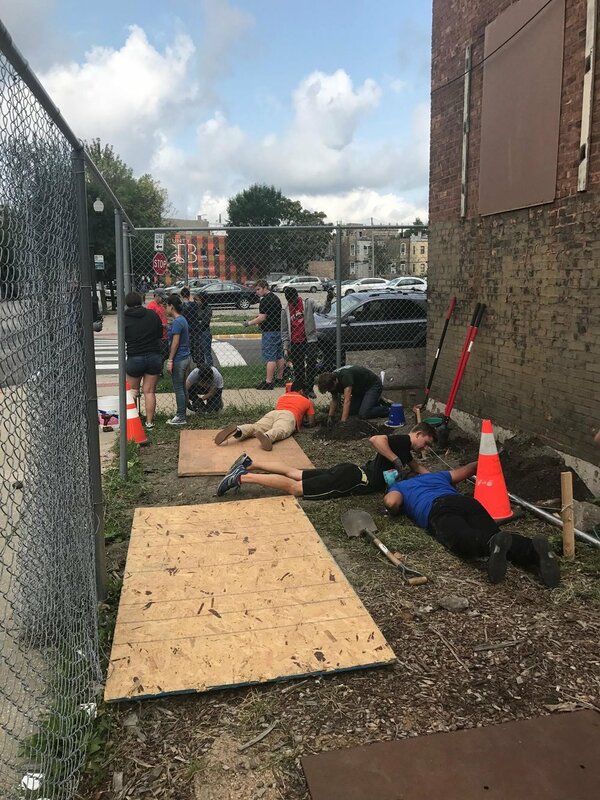 This past weekend we also took advantage of one of our closest Taylor Street neighbors, UIC's Department of Urban Policy and Planning (left) as well as a a series of students from Urban and Cultural Geography classes from the University of Wisconsin Fox Valley (center and right). We hope that you may be able to join us for the Biennial exhibits on display now through November 15th! For more information, click HERE. For information on paid private tours or to serve as a volunteer docent, please contact Katie Samples at ksamples@nphm.org or 773.245.1621. We'll see you on Taylor Street!